If you think about all the little things that bring you joy, you’ll probably find that they range from curling up with a book next to a fire, drinking tea in bed before you start your day, and even calmly sorting out your car insurance online. There’s no telling what lights up a person’s world, but what is sure is that happiness is a lifestyle. One of the best approaches to living a happier life is take a page out of the hygge (pronounced hue-gah, kind of like ‘sugar’) book. This Danish lifestyle philosophy has no direct English translation, but simply, it can be described as an atmosphere in which you feel at home and at your most comfortable. It focuses on being comfortable and content as you go about your daily life. 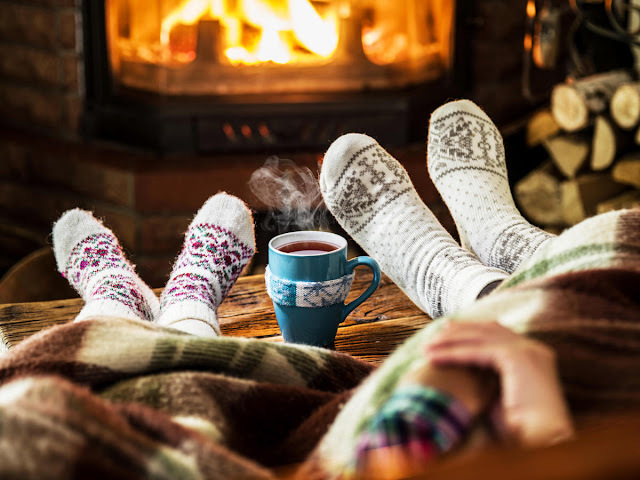 To help you get a little more hygge in your heart, here are a few tips. Generally speaking, hygge is about feeling cozy, which you can achieve by creating stress-free atmospheres in your living spaces. For some, this means placing candles around the house and infusing their homes with the smell of Christmas. Mostly, though, it means decluttering things that don’t bring you joy and filling your home with comfy-cozy textures, like fluffy pillows, different kinds of blankets, softer light bulbs to reduce the strain of a harsher white light, as well as drinking copious mugs of tea and hot chocolate. Ahhhh yes, so much better. It’s not possible to change everything at once. Who has the time, let alone the cash to just update their life in a whirlwind? Not only is it not possible, it’s not healthy and can lead to feeling like a failure if things don’t look and feel how you want them to straight away. Holding hands and snuggle. Walking, reading, sitting on the bus… you can do this anywhere, anytime. Stocking up on candles. Choose different cozy scents for each room of the house and revel in the atmosphere that fragrance creates. Unplugging and writing. Put your phone down, pick up a pen, and write letters to your loved ones – or start a diary, Bridget Jones-style. Investing in soft, cuddly blankets and pillows. And not just for your bedroom, because you can be comfy in any room of the house that has surface on which to sit. Going on nature walks. Nature brings out the hygge, so bundle up in your snuggliest clothes and embrace the fresh air and beautiful surroundings. Choosing not to shower. Showers are functional, so unless you’re in a hurry to get clean, rather have a bath with candles, bubbles, a good book, and some relaxing music. One of the best ways to make sure that your hygge doesn’t stop at home is to make sure that you follow this philosophy at work, too. For instance, it’s highly recommended that you stop multitasking. Instead, slow down and focus your energy onto one thing at a time. You’ll find that you’ll be calmer, more intentional about each project, and more efficient. Write down your notes. Choosing a notepad over your iPad gives your eyes a break from screens and helps you remember what you’ve jotted down more sharply. Bring a little outdoors into your indoors. A few plants, even fake plants (of the better quality), can trigger relaxed emotions, not to mention brighten up the office. Don’t drink your usual cuppa at your desk. Take a proper break in whatever comfy corner you can find. Personalise your space. Without adding clutter, do up your desk with photos of family and friends (in beautiful frames to delight the soul) and update your stationary to add a splash of style and colour. And how do you know if you’ve brought hygge into your heart? Well, that altogether depends on you, but if you start to feel a sense of familiarity, warmth, and contentment wherever you are, then you know that you’re on the right track. If you’re still curious, then there are a few books on the subject, including How to Hygge by Helena Olsen; Hygge, The Danish Art of Happiness by Marie Tourell Søderberg; and The Year of Living Danishly by Helen Russell.